Sometimes, extra diagnostic tests are necessary to rule out potential factors that may be ailing your guinea pig. X-rays are commonly used when the cause of your cavy's discomfort is not obviously apparent or easily spotted. 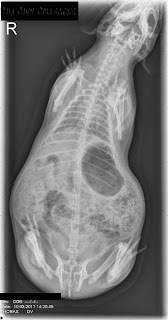 A set of x-rays can show things such as bladder stones, an enlarged heart, and accumulated fluids around the lungs. 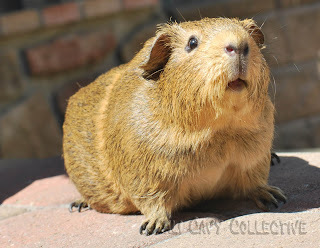 With a cavy savvy vet, these are all treatable conditions - if they are caught early enough. An experienced cavy vet or radiologist should not need to put your piggy under anesthesia. Clear x-rays of Peaches and Belka were taken, even though both were feisty, stubborn, muscular and quite determined to get away. However, it did take several tries, and two people to hold on! 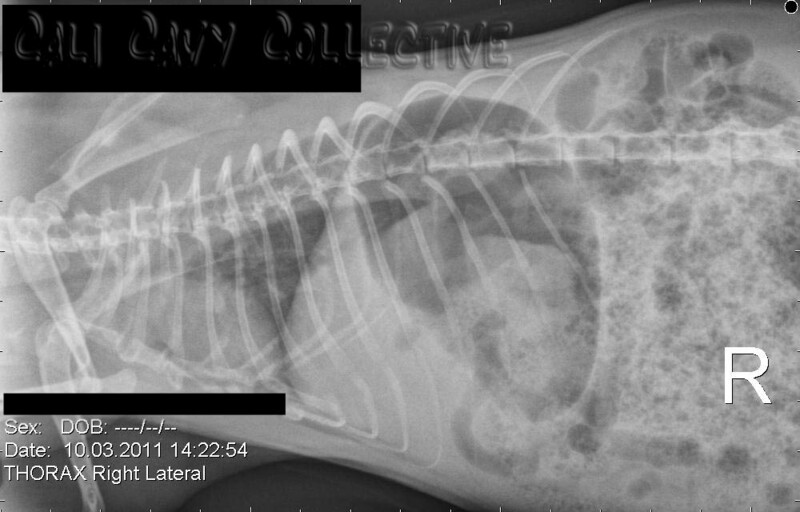 These are Belka's x-rays, taken earlier this month during one of her trips to the vet. Our vet did not find anything amiss on these - no bladder stones, fluid buildup around her lungs, or signs of an enlarged heart. For those concerned about the price, this set of x-rays (described on the invoice as "Xray - 2 views) cost our owners $190. It is costly, but can you really put a price tag on your beloved animal companion's life? Click on the photos for closeups. How fascinating, and interesting that the peegs need not undergo a general. Is Belka all recovered now? We have read on GuineaLynx that unnecessary anesthesia should be avoided if possible - some pigs do not react well to it, so our humans avoid it when they can. After quite a roller coaster, Belka is finally eating regularly enough on her own to sustain her weight and pooping reasonable amounts again! She's kept this up for half a week already, humans are very hopeful.